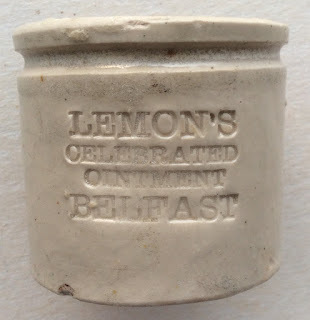 James Lemon is listed in 1877 as a druggist in the Belfast & Ulster directory. In 1884 the directory lists Mr. Lemon as a manufacturing chemist. This is a stoneware type pot, different to the normal ceramic type. The base is impressed with an eagle. Two variations exist, one with lettering on three lines and another (as below) with four lines of lettering. A small article appears in the ABC magazine number 27 concerning the pot with four lines of writing. book produced by Messrs. Houghton & Priestley, page 100.